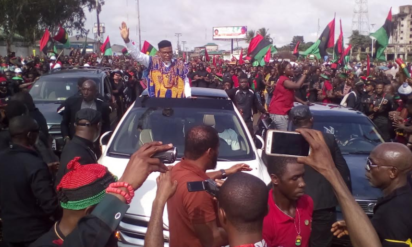 Princewill Obuka , the national Leader of Biafra Nations Youth League, BNYL, has been released from Police custody in Calabar, Cross River State after one week in detention. Obuka and leader of displaced Bakassi youths Linus Essien were arrested along with their members in Ikang Cameroon border following a tip-off operation on 16 Jan 2018, reasons for the arrest was not made public. The group has been accused of plotting violence in the region following reports linking it to the violent outbreak in Cameroon which the group denied. A statement released by its Deputy leader Ebuta Agbor Takon disclosed link with Cameroon separatist leaders.